A new dawn for the TP52 fleet in Europe was signalled in the beautiful sunshine of Barcelona today with the official christening of the Audi Azzurra Sailing Team’s new boat which is expected to be one of the key performers on the new 52 Super Series which starts on Thursday at the 39th Trofeo Conde de Godo. The 52 Super Series is an initiative that has been underwritten by three of the TP52’s most active and enthusiastic owners, Quantum Racing’s Doug DeVos, RAN’s Niklas Zennstrom and Audi Azzurra Sailing Team’s Alberto Roemmers. For the 52 foot grand prix yachts, it will follow the owners and crews’ desire to return to existing regattas at key yacht clubs over the 2012 season. There are four events starting with this regatta in Barcelona, followed by the Audi Sardinia Cup in June at the Yacht Club Costa Smeralda. 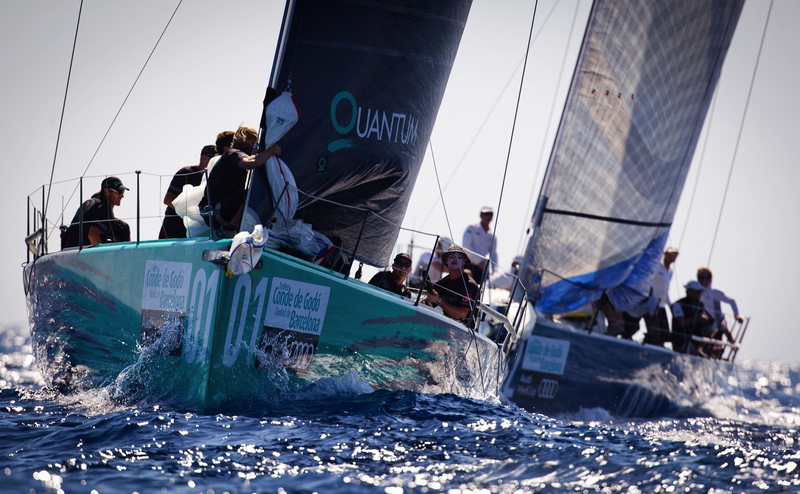 Palma, Mallorca hosts the revived Royal Cup in July and in September the 52 Super Series will be finish up in Valencia with the Valencia Cup. Invited IRC 52’s are expected to join the series at each successive regatta. Five 52’s will compete in this first event where eight races are scheduled over the four days. During the course of the season all race scores will be aggregated with no discards. Quantum Racing have made some changes to their 2011 crew line-up. America’s Cup and Volvo Ocean Race winning navigator Juan Vila will join mainsail trimmer Warwick Fleury, tactician Andy Horton and Chris Welch which again will be skippered by helmsman Ed Baird. Leading tactician Adrian Stead joins the RAN team on one of the two boats driven by owners with Niklas Zennstrom on the helm. The other owner/driver boat is the British team Gladiator with Tony Langley steering, Chris Larson on tactics and Italian navigator Michele Ivaldi. Audi Sailing Team powered by ALL4ONE, lead by Jochen Schuemann and Stephane Kandler, will be joined in Barcelona by Spain’s Gonzalo Aurajo on the helm, French tactician Pascal Rambeau and young German ocean racer Boris Herrmann, who will be making his grand prix inshore debut as navigator.